We made our annual pilgrimage to a friend's cabin on Thetis Island recently. Thetis is two ferries away from Seattle, in the Gulf Islands of British Columbia off the east coast of Vancouver Island. It's pretty much an all-day affair to get there, but once you're there, oh boy is the effort worth it. We lucked out this year with low tides in the mornings, making clam digging the first order of the day. The butter clams, which apparently hold the toxins of red tide longer than other species, are off limits—even though there hasn't been a red tide in recent memory—but littlenecks are plentiful and as big as I've seen them anywhere. Bottom fishing is another regular distraction. Flounder, greenling, rockfish, and lingcod all haunt the lower depths. One of the kids even caught a dogfish. In the ensuing melee of trying to land and release it without losing a digit, the little shark thrilled its antagonists by snapping the rod in two with its jaws. Down, Fido! 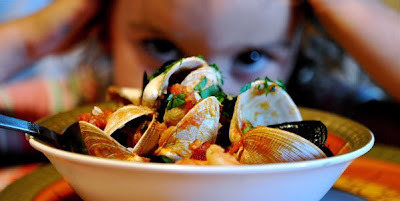 Besides the usual chowder and oyster po 'boys, we made a cioppino one night, cooking the catch of the day (flounder, littleneck clams, mussels) in a tomato-wine broth gussied up with chopped fennel bulb and saffron. The other key ingredient wasn't a food item—it was the camp stove that made the cioppino seem all the more authentic (if I can use a term that normally curdles my appetite). The kids, or some of them at any rate, experimented with their taste buds and their courage. Steamed sea lettuce drizzled with soy sauce over a bed of couscous wasn't so bad after all, a few admitted. And a small gill-hooked flounder didn't even require utensils. There was one big difference between this year and previous: our young charges eventually tired of clamming and fishing, announcing their desire to go after bigger game. In keeping with the practical tenants of The Three-Martini Playdate, we parents heartily encouraged them during one evening's cocktail hour, suggesting they cease running around underfoot and fully investigate the woods out back. Next thing we know, a small mob has armed itself with sticks and is in pursuit of the rather tame local squirrels and robins. The next few days saw steep technological changes—not unlike those occurring over the course of millennia—as the little primates used their enhanced cranial capacity to invent a variety of tools/weapons, including bow-and-arrow and spears with honest-to-god spearpoints. Though the rodents and birds escaped harm this year, we shudder to think what future trips will hold for the hapless critters of Thetis Island. I think it's fantastic that you're teaching your kids all about gathering food in the wild and then introducing them to these wonderful dishes. Almost forgot about that sea lettuce concoction. Tasted like a shredded, salted kitchen sponge. Can't wait for next year, though I hope it doesn't turn into a full-blown Lord of the Flies situation. This is extremely sad to me - that you'd encourage this type of activity, in pursuit of animals like songbirds. Even if the kids didn't have a chance in hell of succeeding, it distresses me that this is condoned. I guess this is why I find myself constantly stopping kids from harming the local birds and animals in parks in my area. I do hope you're at least familiar with the animals protected under legislation like the Migratory Bird Treaty Act. Any harm to a bird like a Robin is prosecutable. Monica - If you were a regular reader of this blog then you'd know that I'm a birdwatcher (a former trip leader for Audubon, in fact) and that my son was IDing dozens of birds BY EAR before entering kindergarten. No, this isn't about killing non-game birds; a different dynamic is at work here, but you seem willfully blind to it. The children were acting out age-old impulses, and while we don't actually condone the illegal killing of an animal, we do enjoy observing our children behaving like...well...children. Please ease up on the sanctimoniousness. hear you on children underfoot. enough of the wii and other electronic gadgets, more homemade weapons! i went clamming as a kid and loved it but my younger siblings were scared as they kept getting sucked into the mud face first, still, i have fond memories. i love this blog, so inspiring! LC, I made a point to read through a good portion of your blog before commenting -- to make sure I wasn't totally out of line. Because of your background, I'm very surprised that a birder would sanction this type of behavior. My parents were early naturalists and conservationists. We foraged, we picked mushrooms and berries and herbs. But under no circumstances did they encourage us to behave this way toward animals. And we still enjoyed being children and interacting with the wild. From an early age, I recall utter enjoyment in respectful observation, without the need to harass and pursue. I work with wildlife so although my comments may seem sanctimonious to you, they stem from an understanding of how such behavior tends to stress wildlife. And how it sets up the relationship kids tend to have with animals thereafter. There is not one person I work with who condones this type of pursuit. Most of us are quite distressed, in fact, over what we witness children doing these days toward animals, often with encouragement from adults. The stress response induced by predators (yes, to animals even small children are predators) can even incite feeding issues in birds and animals. You must know this based on your background, and you must have seen the studies that even point to shorebird feeding disruptions own to children chasing and them on the shoreline as they're foraging. Call that sanctimonious. But I feel utter despair over behavior that threatens or frightens animals who are already overwhelmed by human intrusion, development and technology. Monica - Really, try on a sense of humor for size. The starchy shroud of sanctimoniousness--I'll say it again--just doesn't become you. Have you watched the video? Have you read btwn the lines of the post? Have you really gone back through the rest of the blog as you say? Now I'll be undercutting the light-heartedness of my own post to spell it out for you, but here goes: The children spent the better part of a weekend devising hunting tools, making spearpoints, etc.--as most outdoorsy children will do on occasion, excepting yourself, of course. They spent all of five minutes chasing a pair of robins that couldn't care less. Then they ran around in the woods pretending the rest of the time. That's pretty much it. Your outrage & pedantry is all out of proportion to both the tone and the content of the post.